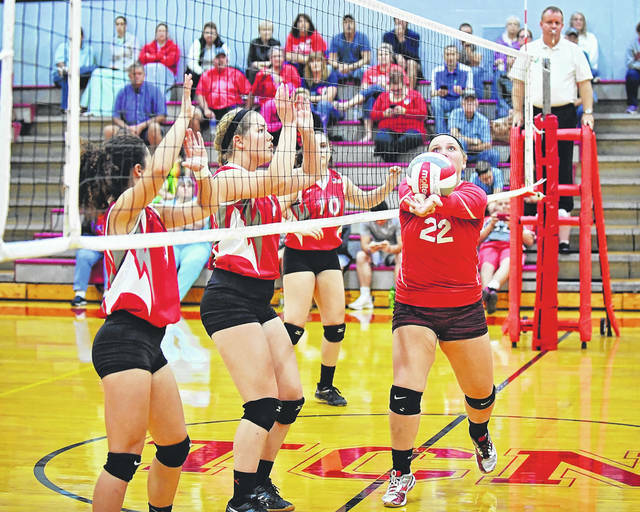 There are high expectations for the county’s volleyball teams this fall as the season gets underway in full force this week. 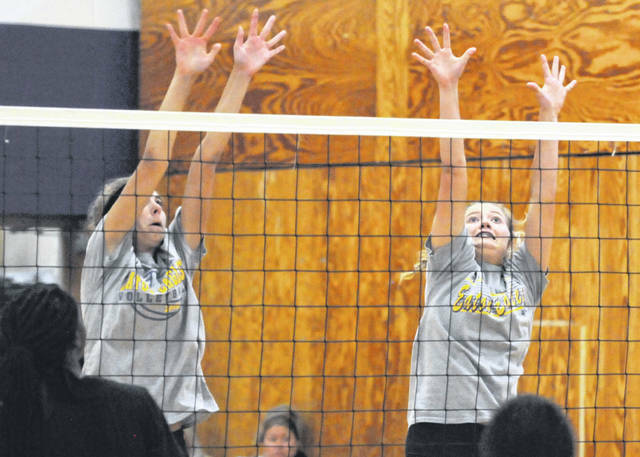 PREBLE COUNTY — There are high expectations for the county’s volleyball teams this fall as the season gets underway in full force this week. Eaton returns all but one players from last year’s team. The Eagles will feature seven seniors this year, including three-all league performers. Annika Gels, Sr. Libero, All-League, All District — “Strong defensive leader in the back, effort is second to none. Natural leader. Annika will be the leading returning digger in our league, and expect that we will have to shuffle her around in the back because teams tend to try to avoid her,” Field said. Becca Mowen, Sr. OH/RS, All-League, All District — “Offers a viable option at either pin when she is on the court. Her shot making and consistency has improved dramatically. Natural Leader. Becca wants to win, and she will do anything asked of her when it comes to helping the team,” Fields said. Maley Tinstman, Sr. S, All-League — “Maley is beginning to take control of the offense. Her decision making and her ability to generate points prom behind the service line will be an asset to the team. Maley works really hard on her game, and puts in a lot of time in the weight room, which every coach can appreciate,” Fields said. Courtney Giffen, Sr. OH — “I fully expect for Courtney is play 6 rotations this season, and to be someone we can count on to make plays when they need to be made. she has made huge strides in her attacking and shot making. Her defense and serve receive will be invaluable to our team. 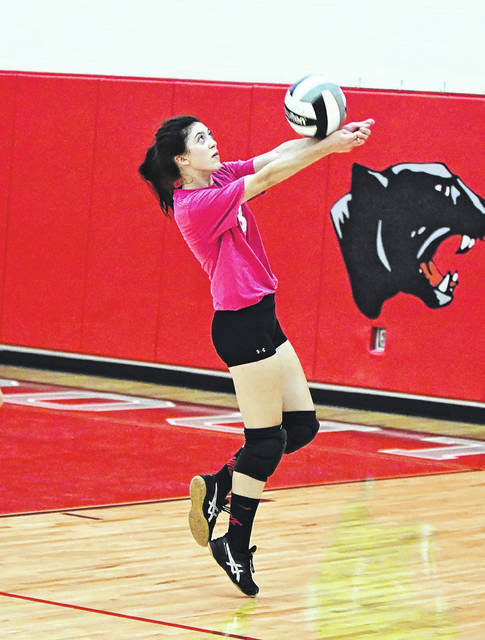 She is also showing us that she can be a leader on and off of the court,” Fields said. Shaylen Perry, Jr. M — “Shay has committed herself to the sport. She is becoming much stronger in her shot making ability, and has made great strides in being our first line of defense against the opponents attack,” Fields said. Ava Miller, Sr. M/RS — Ava worked really hard in the off-season on her connection with our setters. As she continues to improve her ability to close her block and drive in her attacking, she will continue to be an important part of our success,” Fields said. Kayleigh Michael, So. DS — As Kayleigh becomes more confident and vocal along the back line, she will be a kid that servers and attackers want to stay away from. She has very good passing ability, and her serve will produce a lot of points for us this season,” Fields said. Alysa Sorrell, Sr. DS/Utility — “Alysa has the best platform in our program. She covers short balls really well from the wing defender spot. Her serve receive is typically spot on. I look for her to make an impact and to be a form of consistency for our team when she is on the court,” Fields said. Carsyn Lammers. So. S — “I look for Carsyn to come in and help run the offense. She always betters the ball when running the offense. As her defense improves, her time on the court will improve as well. She is strong and consistent from the service line,” Fields said. Starters returning: Lexi Stiner is the only senior on the roster. “A two-year starter and 3rd year letter winner, Lexi led the team in kills and blocks as our MB in 17-18. NT will be looking to Lexi for leadership as one of the team captains and to lead our offense. We are looking for great things from Lexi in her last year as a Lady Blazer,” Yeazel said. Junior setter Brooke Johnson is a two-year letter-winner and two-year starter returning to the Blazers. 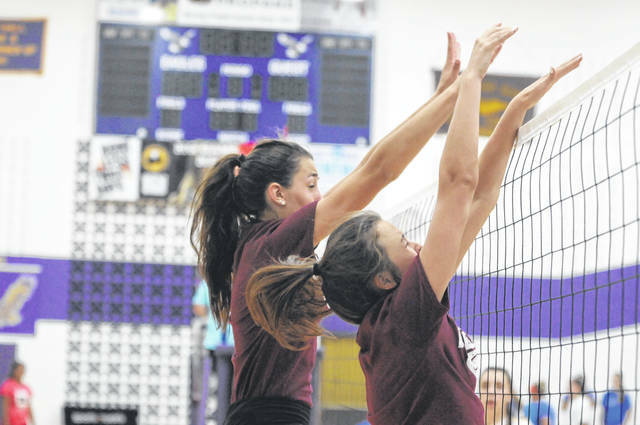 “We will look for Brooke to run our offense with her “soft” setter hands,” Yeazel said. NT had three sophomores who earned varsity letters their freshman year: Angel Bowers, Tristan Bowers and Madison Hathaway. “Angel and Tristan Bowers who were also starters last season, will be called upon to set and to hit. Tristan was second on the team in kills (right behind Lexi) and Angel was second on the team in assists. Madison Hathaway had some big shoes to fill with the graduation of Ariel Lee and the early graduation of Risa Griffin. Risa was only a junior eligibility wise, but decided to graduate early. Madison is playing Libero and is doing a fantastic job. I’m looking for great things from these young players,” Yeazel said. Newcomers to the NT volleyball family are junior Shelby Slade, sophomore. Jaidyn Tout and freshamn Jenna Petitt. ”Look for great things from these young ladies,” Yeazel said. ”I would like for our young ladies to compete and get better each game, if we do that, I see us in the top 1/3 of the league. I expect us to get better and better each game. We are an extremely young team. One senior, two juniors (only one was a letter winner last year), four sophomores (only two were starters) and one freshman. We also have a junior (Jenna Shelley) and twp freshmen (MyKenzie Smith and Abbi Whitesell) who will be splitting time with JV,” Yeazel said. “We have been working hard this summer! All 10 players will be contributors. Kaylie Campbell, senior, is a 4-year varsity player. Will play middle and setter. Campbell was a first-team all-league and all-district selection last season as a junior. Kylie Johnson, who set for the team last year, will be playing libero. Matti Colby returning starter will also play middle. Megan Roell will serve as the other setter. Returning hitter Hailee Howard will be starting this year. Kelsie Asher was out some last year due to an injury during team bonding and will play a hitting role and Jasmine King will also be returning to the hitting line up. Kendal George will be filling a defensive position. Senior Ashlyn Elkins returns to the line up this year as a hitter and Mekayla Matthews will be filling a utility role. Woodard sees Waynesville as the team to beat in the league. “As for the league, I’m told Waynesville will be the team to beat. It is one of our teams goals to do that,” Woodard said. “We will have to focus on every team but since Waynesville is returning seven seniors, this may be one of our toughest challenges of the year. Panthers return six seniors as they look to to challenge for Cross County Conference championship. The seniors include Shyanna Baker, middle, 2-year starter; Riley Cruse, setter, second-team CCC, second-team district, three-year starter; Faith Estep, defense, outside; Jasmine McAdams, defensive specialist, 3-year starter; Abbey Rupp, setter;, Taylor Schumacher, middle, 3-year starter. Two juniors are on the roster. Emma Hale will play strong side and Avry Shank is a defensive specialist. Sidney Jackson, who plays all around, is the lone sophomore. Newcomers are Allie Douglas, junior; Jaelynn Hawkins, sophomore; Annie Ferguson, sophomore; Alexis Heck, junior, to help round out the bench. Wislon-Stockwell said the group has put in the work to be successful. Although Jandee Mowell is in her first season as the volleyball coach at Twin Valley South she is no stranger to the athletes she’ll be coaching. “I am looking forward to my first season as head coach. I have coached all these student athletes as JV players and know their potential. This group of players have a strong desire to win, are not ones to give up easily, have been working hard to improve their skills and work together as a team,” she said. Senior libero Sidney Mowell — four year varsity letterman, who received All-District honorable mention, as well as CCC honorable mention in the 2017 season. Sophomore, outside hitter, Mackenzie Neal — District 15 honorable mention last season. Junior, Claire Fergus, middle — brings energy, hustle and a good court sense. Senior, Rylie Gearhart — quick swing, aggressive server. Junior, Alexis Bennett, DS — team player, aggressive, quick. Junior, Alyssa Clark — strong outside hitter. “My hope is to finish league in the top 5. We have a fast, aggressive team and putting athletes in their best positions should be successful for us,” Mowell said.